In this rare interview Bollywood director Hrishikesh Mukherjee, who died on 27 August 2006, talks about his life and work. The interview was done at his home in Mumbai by Lalit Mohan Joshi, the editor of South Asian Cinema Foundation, in 2000, soon after Hrishi Da got the Dada Saheb Phalke award, the highest award in Indian cinema. 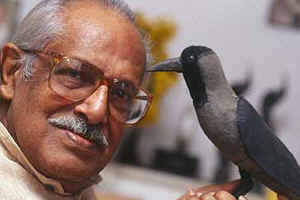 When asked about the absence of violence in his films the maker of films like Anari, Anupama, Satyakam and Anand said “standing on your balcony one can look down and see the dirty drains or can look up and see the beautiful sky and stars.” Hrishi Da always looked up to portray an idealistic, truthful, humane and joyous society.